If you've ever developed a dozen or more complex queries, then had to change one of the table names, you know how frustrating it can be to all but rebuild the queries in the Query Design view grid by changing the table name in each cell. One quick alternative is to choose View >SQL View while the query is open and then cut and paste all the SQL code into Word. Next, do a Find and Replace, changing all the instances of the old table name to the new table name. 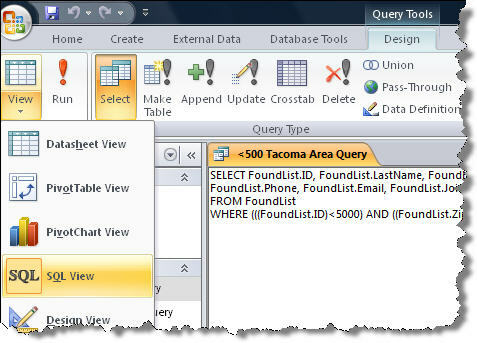 Finally, copy and paste the SQL statements back into the SQL view of your Access queries. When you go back to the QBE, the new table will replace the old one. If you're having trouble figuring out a complex SQL statement for use in code, you may be able to simplify the process by first setting it up the query you want in the query design grid. Once you've got it configured correctly, choose View >SQL view to reveal the underlying SQL statement, which you can copy and paste into your code. You may have to make minor modifications, but this technique often eliminates much of the hassle of manually constructing SQL statements. You can also tweak the underlying SQL code to adjust your Query. This code can also be copied and reused in other Queries after a little customizing.